The Mad Science Group, one of the the world's leading fun science providers, delivers exciting, hands-on and educational science experiences! Each year we spark the imagination of millions of children through an established, global distribution network with offices in every major market in North America and many overseas. We aim to spark the imagination and curiosity of children everywhere by providing them with fun, entertaining and educational activities that instill a clear understanding of what science is really about and how it affects the world around them. Using a technique of hands-on, inquiry based, FUN learning, we will go wherever elementary school aged children congregate to spark an interest in science! As children, brothers Ariel and Ron Shlien loved to conduct crazy science experiments for neighborhood children in Montreal, Canada. In January 1986 a friend who was teaching a science and technology course at a local Montreal YMCA desperately needed an exciting grand finale. Ariel brought a Helium-Neon laser and the children were amazed! 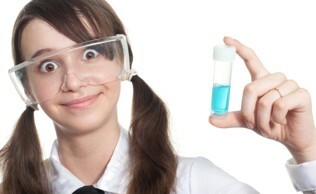 The idea for Mad Science was born: kids like fun, cool science. The development of "edu-taining" birthday parties was a natural outgrowth of the popularity of Mad Science demonstrations, and within just a few years, thousands of children throughout the city were enjoying official Mad Science programs. In March 1990, the name "The Mad Science Group" was registered. In August 1993, efforts were extended toward new markets and new products. Mad Science signed a contract to provide Royal Caribbean Cruise Lines with an exciting new breed of cruise programming, word of mouth took over, and Mad Science shows became an integral part of Royal Caribbean Cruise Lines' Adventure Ocean Programs. When enough parents, teachers and organizations started asking "how can we have Mad Science in our city? ", the next step was obvious: franchising. In 1994, franchises were opened in Toronto and in Florida. Since then, over 200 franchises have been opened in 25 different countries over 6 continents. Mad Science of Southern Massachusetts began serving Southeastern New England as a Mad Science Group franchisee in September of 2002. Covering Cape Cod, Southern Plymouth County, and Barnstable County, we have been bringing FUN science "edu-tainment" to elementary school age children through Workshops (In-class field trips), After School Programs, Birthday Parties, and Special Events (science shows). In May of 2003, Mad Science of Southern Massachusetts added Rhode Island to its territory to bring Mad Science programming to more children of Southeastern New England! Mad Science of Southern MA & RI and The Mad Science Group are affiliated with the National Science Teachers Association (NSTA) and the American Association for the Advancement of Science (AAAS). We are also a member in good standing of After School Activity Providers (ASAP).